Back in 1997, Gulab Singh Tanwar quit his job as pilot with Indian Airlines to start Saarthi Airways, a private air charter service. He began with a single leased helicopter and a single client - the makers of the Ajay Devgn-Saif Ali Khan 1999 hit, Kachhe Dhaage. The next year he bought an aircraft, a Cessna 172, and started hiring that out as well. A decade and a half later, with a turnover of `67 crore in 2015/16, Saarthi Airways is one of the key operators in the air charter business. Tanwar's choppers and aircraft have been used by politicians in every general election since the turn of the century - in 2004, 2009 and 2014 - apart from several state elections. He is the Bharatiya Janata Party's (BJP) preferred operator for polls, handling around 80 per cent of its charter service demand. But he insists his risks are no less than those of the profusion of smaller players who have sprung up over the years. "It is a highly competitive business," he says. With campaigning in full swing for the assembly elections in Uttar Pradesh, Uttarakhand, Goa, Punjab and Manipur in February-March, Tanwar is now busier than ever. Besides the two machines he currently owns - a Beechcraft Super King Air B200 aircraft and a Bell helicopter - he has leased four more helicopters and two aircraft for about two months, primarily to cope with the increased demand. Market experts estimate that in the current elections, the overall flying business is likely to touch Rs 60 crore. Unsurprisingly, the maximum demand is in the largest and politically most crucial state of UP, where, in all, 17 helicopters have been deployed to ferry politicians of all hues. "The vast geographical spread of UP requires travel by helicopter," says Rohit Kapur, Managing Director, Arrow Aircraft Sales and Charters. "There is a surge in chartered flying from New Delhi to Lucknow and Kanpur. Planes are also being booked from Delhi to Goa and Punjab, but in these states distances between cities are short enough to be covered by road in a few hours." Typically, while campaigning in UP, a senior politician like say, Rahul Gandhi, would fly from New Delhi to Lucknow in a private jet, say the Dassault Falcon 2000, and thereafter board a Bell helicopter to address rallies in smaller towns such as Gorakhpur, Sitapur or Mainpuri. All the leading political parties in UP - the BJP, the Congress, the Samajwadi Party (SP) and the Bahujan Samaj Party (BSP) - have begun hiring choppers and aircraft. Thanks to demonetisation, however, the demand in UP is lower this time than in the last assembly polls of 2012, when around 30 helicopters were in use. "The demand from smaller parties hardly exists this time, while the larger parties are hiring helicopters and jets in lower numbers," says Kapur. The electoral alliance between SP and Congress, reducing most of the assembly seat contests from quadrangular to triangular, has also had an impact, since the number of serious contestants are fewer than last time. "It will result in lower demand for choppers and aircraft," says Sandeep Saraf, Founder of Delhi-based air charter company Pinnacle Air. All big political parties have a broker or two to manage their helicopter and aircraft requirements, both at the Central and the state levels. Each party also creates a special cell during elections to handle the logistics of its leaders' air travel. The brokers usually hire choppers for 10-20 days at a stretch for the national parties, and sub-lease them to the parties concerned, while small parties and independents usually hire for much shorter durations. "The demand from large parties is genuine, while independent candidates hire mostly to show off," says Tanwar. 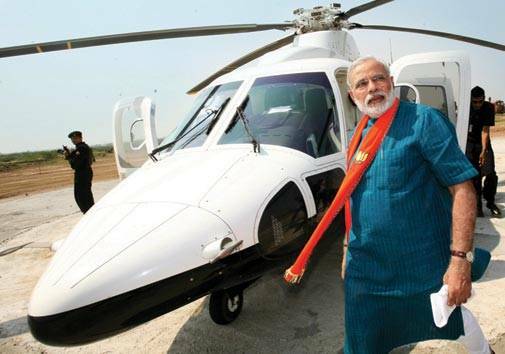 The rates are nothing to sniff at - a helicopter, like the six-seater AugustaWestland AW109, costs `1.5 lakh per hour. For aircraft, rates vary widely depending on whether they are turboprops or jets - the 13-seater Beechcraft King Air B200, costs around `85,000 per hour, while a twin engine jet like Dassault Falcon 2000, which carries 10 passengers, would charge nothing less than `2.70 lakh per hour. No doubt turboprops are way cheaper, with much the same seating capacity, but jets are faster, safer, more comfortable and less noisy. Indeed, the government has advised VIPs to stick to jets due to safety concerns. Despite the steep charges, the margins are narrow, gross profit ranging around 7-10 per cent and net profit at a mere 2-3 per cent. "Being a bigger player does not mitigate risk, nor does it translate into higher profit margins," says Tanwar. "Most operators charge the same rates since, given the narrow margin, there is hardly any scope for undercutting." The regular business of these companies - called non-scheduled operator permits (NSOPs) in the trade - comes from state governments, large companies both in the public and private sectors, the entertainment industry, the medical sector and wealthy pilgrims. Elections, with political parties doing the hiring, are an occasional bonus. Do NSOPs raise their rates to make hay in election season? "Prices have shot up 20-30 per cent in the last few weeks due to the rise in demand from political parties," says Rajeev Wadhwa, Chairman and CEO of air charter company Baron Luxury. But Tanwar denies it. "No doubt, in the 2014 Lok Sabha elections, when the demand was much higher, rates did rise, but this time they are stable," he says. "There are enough machines to meet the demand this time." Overall, in 2015 India had a total business aviation fleet of 487, comprising 245 helicopters, 100 turboprops and 142 business jets. The highest demand so far was during the 2014 general elections, when an estimated 75 helicopters, 40 turboprops and 20 business jets were deployed for electioneering. According to the Business Aircraft Operators Association, widespread use of choppers and aircraft during electioneering began in 1996/97. In those days, operators certainly had the upper hand over political parties, hiking their rates at will, since machines were few. Even in the early 2000s, political parties would rush to book as soon as polls were announced, fearing that if they delay, they would fall short of their needs with rival parties already having booked the machines available. "Some regional parties would even block a large number of helicopters just to sabotage the campaign plans of national parties," says an operator who prefers not to be named. In those days, parties readily committed to using a certain number of helicopters and planes. They no longer do so, knowing there are enough machines around and often even cancel bookings at short notice. In the circumstances, air charter companies have had to learn to anticipate demand during elections correctly and remain prepared, if necessary by leasing more helicopters and aircraft in advance. "That's the biggest risk - one has to go by gut feeling and past experience in balancing the demand-supply equation," says Tanwar. Lease too many which remain unused and losses mount; lease too few and opportunities are lost. In recent years, however, following a steep increase in the import duty on flying machines, their imports have dropped sharply and as demand rises in coming years, the supply of machines might fall short. Indeed, air charter companies now have to be proactive to get business from political parties. The key differentiator is personalised service. "I employ 35 people, but I try to be physically present on the tarmac whenever one of my machines is taking off or landing," says Tanwar. He uses his contacts, built over years, to minimise delays in getting airport clearances. "I have to ensure my guests don't face inconveniences," he adds. "It's all about dependability. People who are paying the kind of prices we charge want the best bang for their buck. For them, every minute counts." He expects the current round of elections to increase his revenue this year by 30-40 per cent.